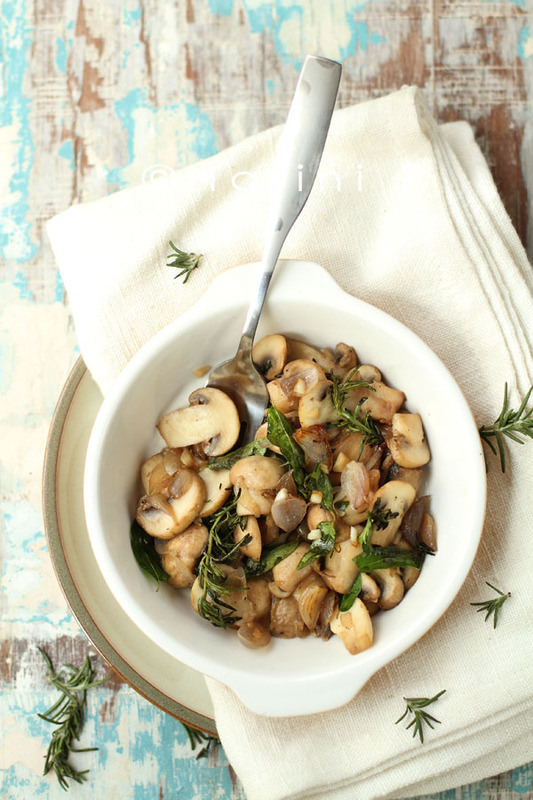 One vegetable I can never get enough of is mushroom! Mushrooms have the capability of carrying a dish forward with minimal additions. Not to mention that they cook fast, and taste great. Growing up, we never had mushrooms. Mushrooms were viewed with fear. For some reason most fairy tales chose to malign these tasty species branding them poisonous or making them homes to toads and frogs. I am told by many that it is the meaty, chewy texture that is a put off. I disagree. It is the chewy texture is that makes it a favourite with me. In today’s dish I haven’t masked the mushrooms. Instead I chose to flaunt them. I believe that when you treat your vegetables with respect, they taste best. Here they are paired them with shallots or sambar onions. Shallots are sweeter than regular red onions and cook faster which makes them ideal to be paired with mushrooms. While cooking shallots one needs to be careful not to leave them unattended. They go very quickly from sweetly caramalized to bitterly burnt. Take care. I added rosemary stalks because they were available, and they worked well. The recipe is only slightly different from my earlier recipe for thyme mushrooms. It is a natural adaptation from that one but the shallots, believe me, make all the difference. The two recipes, though identical, work very differently on the taste buds. Selecting mushrooms: There is not much scope in India at least. We get only butttom mushrooms in most shops though portabella has been making the rounds too. Button mushrooms here, come in packets. I suggest you run them over with a keen eye. They should not have blemishes, a bit of dirt will do and they should be white without discolouration. Cleaning: Our mushrooms do have a lot of dirt. I usually rinse them in a vessel containing clean water once, before rinsing them again in running water. Gently brush the tops with your finger tips to get rid of the dirt. If the mushrooms are fresh you should be able to get rid of the dirt very soon. If being gentle does not work, use some salt on your finger tips and brush. Cooking: Mushrooms cook very fast and sweat a lot. The best method to cook them is to saute on high heat. Heat your wok/kadai, add oil and heat to a medium hot. 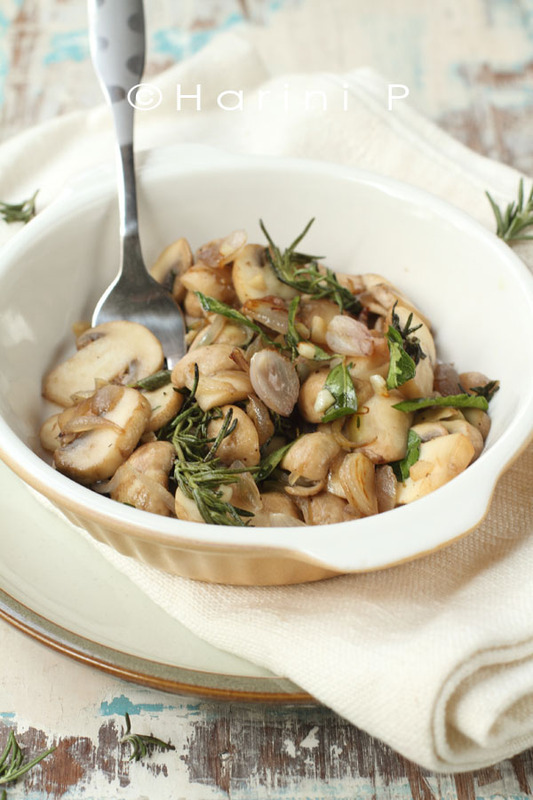 Once you have added mushrooms, keep sauteeing and do not leave them unattended or closed. They will sweat and in this dish you need to be careful because it is a dry one. Oil: Mushrooms are great, no matter which oil you use. I have sauteed them in olive oil as well as mustard oil before. But I really cannot think of anything other than coconut oil for today’s dish, possibly because I am using shallots which is a very South Indian ingredient! You should use whichever oil you like. Pepper: Malls here have started stocking ‘Keya’s’ pepper mixed with citrus peels and rock salt these days. I love the flavour you get by crushing this all over the dish, and I am pretty generous with it. You might want to use green or black pepper as per choice and availability. Rinse mushrooms gently in water to get rid of mud and pat dry. Halve the small ones and cut the large ones into four slices. Heat a wok till hot. Pour the oil. Add curry leaves and when they crackle and crisp up add sliced shallots and stir a minute. Add a pinch of salt and rosemary. Stir till the onions turn pink, about 1-2 minutes. Add the sliced mushrooms and stir-fry on high flame for 3minutes and adjust salt to taste. Mince garlic and chillies together coarsely and add. Stir till flavours meld and mushrooms are just cooked, about 2-5 minutes. Do not reduce heat or place a lid, as this will cause sweating. Check whether the mushrooms are done. If not, cook a minute or two more. Remove onto a dish immediately and add crushed pepper. Serve over toasted bread or with rotis, and parathas. Rosemary sprigs may be removed before serving. I have kept them in the photograph only to emphasize that they were in the dish. I also reserved some of the crisped curry leaves from my tempering in the beginning to garnish the dish. This is purely for adding aesthetic value to the photograph. I admit I like crisp curry leaves. Do you? Stir-fry mushrooms on high heat. Use salt sparingly as mushrooms wilt easily. Coconut oil may be substituted with olive oil or even mustard oil. Add curry leaves and dried red chillies in the beginning instead of rosemary, for a truly South Indian experience! For robust European flavours, add half a teaspoon of balsamic vinegar while mincing the garlic, use olive oil, thyme instead of rosemary if you like, and garnish with some pinenuts. You could add a teaspoon of balsamic vinegar but I am not a fan of acidity in my foods. I actually like my foods tasting mild and more towards bland than spicy!! Hi Harini, how have you been? You have done an amazing job in your blog with the recipes and pictures. How and when did this happen? Great job Harini. The blog looks very cool and professional. I’m a wee bit jealous too! This recipe is very similar to one my mum makes. We never had mushrooms growing up, but the wood behind my grandparents house had tons which we would go out and pick after rainstorms. My mum used to stir fry very quickly in the Mangalorean ‘tel piaow’ style, with oil and onions, and then we would eat it with congee. So simple, yet so flavour packed. Ha ha! I too am surprised. 🙂 But it is interesting! I am obsessed with mushrooms, I can eat them raw 🙂 This recipe looks so simple yet so good!!!! Oh wow, Priyanka! I am obsessed too, but I still haven’t tried dried shitake mushrooms that can be taken raw. Yes, this is a simple but delicious recipe. Do try it! I have a problem having mushrooms for the same reasons that you’ve mentioned….I read that they are low in calories yet very nutritious. Just beginning to add them once in a way. Have to try them with shallots and the coconut oil. Way to go, Lata! You could try them with mixed vegetables before you try them separately, and I am sure you will like the sweetness of the shallots and the coconut oil in this.